Shenzhen-headquartered OnePlus hasn’t been around for long but caused a tremendous stir by selling power-packed phones that sell at a significantly lower price in comparison with other manufacturers. Founded in 2014, the rising upstart OnePlus is making some much-needed noise across the globe including the Indian smartphone market. A couple of years ago, Carl Pei, Co-founder, OnePlus, mentioned that the Android smartphone makers are more focused on marketing than producing the best product. On the other hand, OnePlus aimed to design a smartphone with a top-notch quality and groundbreaking specification at a lower price than other smartphones in its class, thus OnePlus One was born. With the OnePlus One, the company also introduced a one-of-its-kind invite system to purchase the device. As per the invite system, Invites are handed out through various means including social media, promotions, competitions and more whereas the OnePlus owners can also share invites with their friends. These marketing tactics along with positive WOM (Word Of Mouth) enabled OnePlus to build a community and loyal fanbase. While most of them thought the invite system will cease to exist with OnePlus 2, the company proved it wrong. Furthermore, to generate hype, the company kept it’s device specifications under wraps and decided to post it one by one gradually. This created a positive vibe around OnePlus 2 even before launch with enough discussion on forums, social media, and some important feedback. With the launch of OnePlus 2, the company started establishing itself as a serious threat to other Android smartphone makers. Having said that, there is no looking back for the upstart since the launch of OnePlus 3 till now (OnePlus 6). Over the years, the company has built trust, goodwill and a strong footprint in the Indian market. The sales of OnePlus 3/3T, 5/5T turned out to be a stunner around the world. Furthermore, the company also mentioned that the 5/5T sold 3x more units than the OnePlus 3T in the same period. Adopting an approach of two flagships per year or every six months, OnePlus keeps building on the success of its predecessors. It’s worth mentioning that, in between these launches, the company also rolls out the limited edition variants as well. A couple of months back, the upstart launched its OnePlus 6 smartphone in the Indian market with a completely new design compared to the predecessor, large screen with a notch, glass body, and brings several new features such as OIS, water-resistance and more. 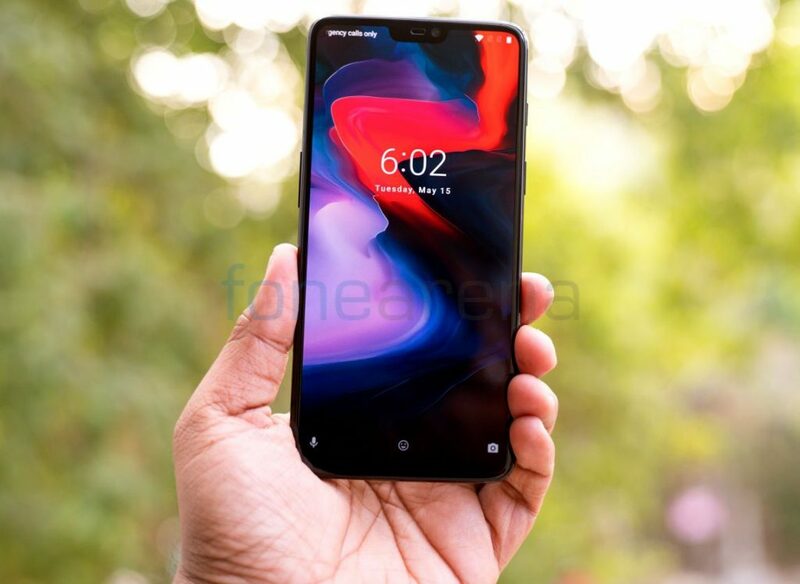 Since the launch of the device with an exclusive tie-up with Amazon India, the company’s flagship smartphone has crossed 1 million sales globally within 22 days. It also became OnePlus’ fastest selling smartphone since the first OnePlus One smartphone was launched back in 2013. The company also said that its ‘one flagship a year’ strategy has allowed the company to create superior products with premium user-experience. As a result, the OnePlus has taken the throne in the premium smartphone segment beating both Samsung and Apple for the first time ever for a full quarter. This wouldn’t have been possible if not for the tremendous sale of OnePlus 6 which was launched during the quarter, as per counterpoint research. 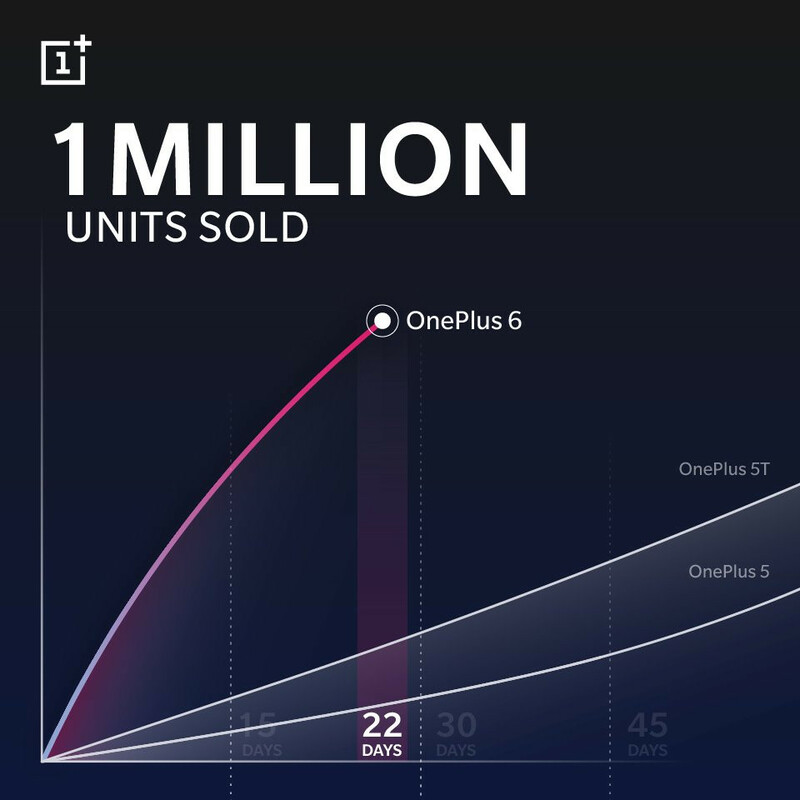 It’s worth mentioning that, the userbase of OnePlus in India is growing with each and every flagship launch and it is now translating into a record sales. 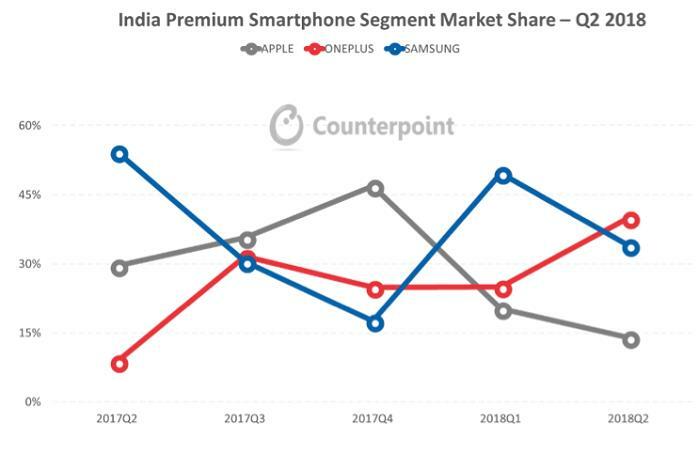 In this regard, OnePlus led the premium smartphone segment for the first time ever in India, capturing 40% of the market driven by record shipments. These initiatives and unconventional marketing from OnePlus show that they are geared up to take the game to the next level in the coming year. To remind you, the OnePlus 6 packs a 6.29-inch Optic AMOLED display with a notch, 84% screen-to-body ratio, Corning Gorilla Glass 5 protection, is powered by Snapdragon 845 Mobile Platform with up to 8GB of RAM, has a 16-megapixel rear camera with f/1.7 aperture, OIS, EIS, 20-megapixel secondary camera with f/1.7 aperture for portrait shots and 2x zoom, 16-megapixe front camera, runs Android 8.1 (Oreo) with OxygenOS 5.1, with Android P coming soon. In addition to fingerprint sensor on the back, it has face unlock to unlock the phone in 0.4 seconds, and the company has retained the alert slider which is now on the right side. It has a 3,300 mAh battery with OnePlus’ Dash Charge (5V 4A) fast charging. It promises whole day of battery life with half- hour charge. The OnePlus 6 starts at Rs. 34,999 for the 6GB RAM with 64GB version and is available exclusively from Amazon.in, OnePlus.in and OnePlus Authorized and Experience stores offline in Mirror Black, Midnight Black, Silk White and Amber Red colors.